« Will Congress Reject Trump’s Job-Killing Tax Increases on Trade? Fiscal Fights with Friends: Should there Be a Federal Program for Paid Parental Leave? Back in 2015, I wrote some columns about policy differences with folks who normally would be considered allies. In Part II, I explained why I thought a comprehensive fiscal package from the American Enterprise Institute was too timid. In Part III, I disagreed with Jerry Taylor’s argument for a carbon tax. Now it’s time for another friendly spat. A handful of right-of-center groups and individuals have decided to embrace a new entitlement for paid parental leave. Such as the Independent Women’s Forum. …the United States is the only industrialized nation that does not mandate or subsidize at least some form of paid parental leave. …there is a way for the federal government to provide paid parental leave to every worker in the United States at no additional cost: offer new parents the opportunity to collect early Social Security benefits after the arrival of their child in exchange for their agreeing to defer the collection of their Social Security retirement benefits. …New parents deserve this choice. Along with the American Enterprise Institute (cooperating with the left-leaning Urban Institute). …public interest in creating a federal paid family leave policy has grown. …we came up with a compromise proposal… Its key elements are benefits available to both mothers and fathers, a wage-replacement rate of 70 percent up to a cap of $600 per week for eight weeks, and job protection for those who take leave. It would be financed in part by a payroll tax on employees and in part by savings in other parts of the budget. …we felt an obligation…this was better than doing nothing when the US is the only developed nation without a national paid leave policy. And Ramesh Ponnuru of National Review. The more I’ve followed the debate, the more I’ve supported the idea. …there are certain similarities between the personal-account and paid-leave ideas that ought to reduce conservative skepticism of the latter. …there’s a mental block that’s keeping the paid-leave objectors from seeing how much these debates have in common. Kristin Shapiro of IWF and Andrew Biggs of AEI elaborated on a version of this idea in a column for the Wall Street Journal. The U.S. is the only industrialized nation without a law guaranteeing workers paid parental leave. The idea has broad public support, but how to pay for it? One idea is to mandate that employers fund it, but economists find employers offset the cost by reducing wages for female employees. …Our proposal is simple: Offer new parents the opportunity to collect early Social Security benefits for a period—say, 12 weeks—after the arrival of their child. To offset the cost, parents would agree to delay collecting Social Security retirement benefits… We estimate that to make the Social Security program financially whole, a parent who claimed 12 weeks of benefits would need to delay claiming retirement benefits by only around six weeks. …This idea should be considered as Congress turns to entitlement reform. It’s a fiscally responsible opportunity to help parents and children. All of this sounds nice, but there are several reasons why I’m very skeptical. But let’s first distinguish between a very bad idea and a somewhat bad idea. The AEI-Urban scheme for a payroll-tax-funded paid leave program is the very bad idea. The United States already has a baked-in-the-cake entitlement crisis, so the last thing we need is the creation of another tax-and-transfer program. So I’ll focus instead on the IWF-designed plan to enable parents to get payments from Social Security when they have a new child. From a big-picture philosophical perspective, I don’t think the federal government should have any role in family life. Child care certainly is not one of the enumerated powers in Article 1, Section 8, of the Constitution. 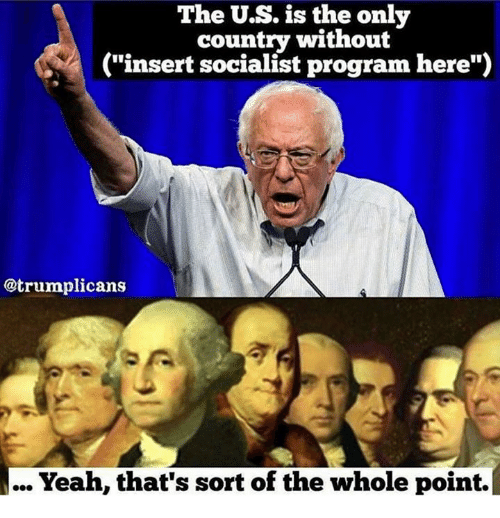 Proponents of intervention routinely argue that the United States is the only advanced nation without such a program, but I view that as a feature, not a bug. We’re also the only advanced nation without a value-added tax. Does that mean we should join other countries and commit fiscal suicide with that onerous levy? Another objection is that there is a very significant risk that a small program eventually become will become much larger. I haven’t crunched the numbers, but I assume the plan proposed by Shapiro and Biggs is neutral. In other words, the short-run spending for parental leave is offset by future reductions in retirement benefits. But once the principle is established that Uncle Sam is playing a role, what will stop future politicians from expanding the short-run goodies and eliminating the long-run savings? It’s worth remembering that the original income tax in 1913 had a top rate of 7 percent and it only applied to 1/2 of 1 percent of the population. How long did that last? Finally, I still haven’t given up on the fantasy of replacing the bankrupt tax-and-transfer Social Security system with a system of personal retirement accounts. Funded systems based on real savings work very well in jurisdictions such as Australia, Chile, Switzerland, Hong Kong, and the Netherlands, but achieving this reform in the United States will be a huge challenge. And I fear that battle will become even harder if we turn Social Security into a piggy bank for other social goals. For what it’s worth, this is also why I oppose plans to integrate the payroll tax with the income tax. Now let’s see what others have to say about a new entitlement for parental leave. Veronique de Rugy of Mercatus explains for National Review why Ramesh’s support for a new federal entitlement is the wrong approach. …we don’t currently have a national parental-leave entitlement. Yes, the plan he’s talking about isn’t as bad as what Hillary would propose, but it still assumes that the federal government should be playing a role in this. Let’s not pretend otherwise. It relies on the government-run Social Security system, and it increases spending for a good while. That’s regress, not progress. And we also need to be realistic. Once the door has been opened, the Left will radically expand the scheme in ways that none of us like. And, to be honest, I can already hear future conservatives demanding that the program be expanded because parents who have to retire a few months later because they use paid leaves pay “a retirement penalty” compared to non-parents. …my point of reference for judging this plan is economic freedom and smaller government involvement. If you prefer more pro-family benefits even at the risk of growing the government, then we won’t agree. Writing for Reason, Shikha Dalmia also is a skeptic. …this is a flawed proposal that’ll do more harm than good, including to its intended beneficiaries. …The scheme will incentivize more workers to take off and for longer periods of time. This will be especially disruptive for small businesses and start-ups that operate on a shoestring budget and can’t spread the responsibilities of the absent workers across a large workforce. They will inevitably shy away from hiring young women of childbearing age. This will diminish these women’s job options. …Furthermore, it isn’t like Social Security has a ton of spare cash lying around to dole out to people other than retirees. The program used to generate surpluses when its worker-to-retiree ratio was high. But this ratio has dropped from 42 workers to one retiree in 1945 to less than four workers per retiree now. And even though payroll taxes have gone up from 2 percent at the program’s inception to 12.6 percent now, the system is still taking in less money than it is paying out in benefits, because of all the retiring baby boomers. …It is also beyond naïve to think that once the government is allowed to dip into Social Security to pay for family leave at childbirth, it’ll simply stop there. Why shouldn’t families taking care of old and sick parents get a similar deal? Liberals are already floating proposals to use Social Security for student loan forgiveness. The possibilities are endless. The Wall Street Journal opined against the idea last month. …some in the ostensible party of limited government think this is the perfect time to add a new entitlement for paid family leave. …this would shift the burden of providing the benefit from the private economy to government. Academic evidence shows that family leave keeps employees in their jobs and can make them happier or more productive, which is one reason many companies pay for it. But why pay when the government offers 12 weeks? …This “crowd out” effect is a hallmark of all entitlements… Also strap yourselves in for the politics. Social Security started as a 2% payroll tax to support the elderly poor, but the tax is now 12.4% and the program is still severely under-funded. The WSJ shares my concerns about a small program morphing into a huge entitlement. No politician is going to deny leave to a pregnant 22-year-old merely because she hasn’t paid much into Social Security. Watch the social right demand a comparable cash benefit for stay-at-home moms, and also dads, or caring for an elderly dependent. And wait until you meet the focus group known as Congressional Democrats, who are already dismissing the proposal as unfair for forcing women to choose between children and retirement. Democrats will quickly wipe out the deferral period so everyone is entitled to leave now and get the same retirement benefits later. And once Republicans open Social Security for family leave, the door will open for other social goals. Why not college tuition? …every entitlement since Revolutionary War pensions has skied down this slope of inexorable expansion. Disability started as limited insurance but now sends checks to roughly nine million people. Medicaid was intended to cover the vulnerable and disabled but today dozens of states cover childless working-age adults above the poverty line. If you want more information, I had two columns last year (here and here) explaining why federally mandated parental leave is a bad idea. To put the issue in context, we should be asking whether it makes sense for the government to make employees more expensive to employers. And since this proponents will probably sell this new entitlement as being good for new mothers, it’s worth pointing out that even a columnist for the New York Times admitted that women actually get hurt by such policies. Remember, if someone says the answer is more government, they’ve asked a very silly question. If you refuse Medicare Part A, you will be deprived of “Social Security.” So, for me, it is “Social IN-Security. This is the Social security Program Operations Manual no. HI 00801.002, put in place by Low-life Clinton. They should give us back our money, confiscated from us at the point of a gun in taxes, with interest, instead of sending it to Pakistan, etcetc etc. A lot of people on Medicare take the money from younger working taxpayers; money they have NOT “contributed” (an 83 yr old today was 30 53 yrs ago, when Medicare started; so , paid in for only 35 yrs; I will have been forced to pay in for 48-51 years; AND at a much higher RATE! They spend their own money on golf, cruises, 2nd homes; the folks on Medicaid spend it on booze, cigarettes, tattoos. The USA is no longer a free nation. I am a slave to people on Medicare and Medicaid, and I hate it. I have refused to be forced into Medicare Part A, so I am being deprived of even one cent back of the over $300,000 I have been forced to fork over to the gov’t to be distributed to other peoples’ parents, and to people “on” Medicaid, ever since I started getting W2 money as a 17-year old orphan. I detest the government, FDR-that SOB Communist, and all the ignorant Socialists. Medical care, child care, etcetc -not proper functions of government. The proper action is to oppose this stuff. FDR conducted an un-remarked-upon coup d’état against our American Constitutional Republic, and we are getting sicker. I also forgot to mention that a major element of Social Security already is a transfer of wealth from the unlucky who die young to the luckier who will outlive them by several decades. But again in a democracy the deciding factor is that the dead no longer vote. The overwhelming super majority of voters are either people who have not discovered yet that they will die young, or people who died young, therefore they’re dead, therefore they no longer vote. The total aggregate number of voting years people spend in the knowledge that they will die young is a small minority, therefore they do not matter even though the proportion of people affected is quite large. That is why social security is a transfer from unlucky to lucky that survives in most democracies. And again… nobody wins elections going against voter lemmings, therefore most nations will continue their sub optimal trajectories… and quickly fall seriously behind the few nations that do not… in this now fast exponentially growing world. Could not agree more. Although I am a parent, subsidies for children are nothing but redistribution from the unfortunate who have no offsprings to the lucky who do. I guess in a democracy the childless matter less since they will leave behind fewer voters? Also please note that VAT when first established had rates in the single digits. Now rates are in the 20-25% range, with, of course, progressively higher impact the poorer a taxpayer is — yet all the poor stay silent! Soon social security will provide food stamps, housing downpayments, underage child support, educational grants, rent assistance,… all in exchange for a delay in retirement age. Then what are we going to do with the sixty five year old destitute living under the bridge who cannot collect social security until eighty five (or seventy for that matter) because he used many early benefits? I suppose once the parental leave expands to eighteen months (as if eighteen months with your child were really enough in a “decent” society!) then one could go through life never working and continuously having children. Then all we would have to do is support those children until they are sixteen… at which point they too can enter the child production pipeline. It would be almost amusing to find a leftist who castrated himself/herself to help stave off global warming supporting this socialist proposal. 2. First, they implicitly use a 3% discount rate, while history shows 5% is more appropriate. That raises the 6 weeks to 14 weeks. 3. Second, they seem to ignore the reduced net-value from both lower earnings and higher benefits. that adds 2 more weeks — up to 17 weeks, nearly three times their claim. 4. Third, they don’t address what happens if subsequently the beneficiary stops working or works part time or works at a lower-paying job. In particular, what happens if the beneficiary withdraws more than his or her full OASI contribution value and fails to go back to work at all? Other folks pay for the leave. 5. Fourth, and perhaps most important, this scheme would accelerate the depletion of the hypothetical OASI trust fund by between one and two years — on top of the acceleration already created by diversion of OASI funds to the depleted disability fund. (While the trust funds are strictly mythical constructs, depletion is the even that will trigger either reduced benefits, higher taxes, or increased debt financing. 6. Fifth, the accelerated depletion is only a specific consequence of the increased impact on overall fiscal imbalance because benefits are paid between 30 and 40 years before they are returned through extra work. 7. Actually, the proposal makes the case for personal retirement accounts. If I own my account, perhaps I could make early withdrawals for parenting or other needs, but I couldn’t withdraw more than the value of the account, and I, and only I, would be responsible for making up the difference through delay of retirement or makeup payments into the account. If we are to have a chance at limited government, it must be Republicans that make it happen. For sure it will not be Democrats. And I doubt that Libertarians (or any third party) will garner enough votes to become dominant. So, if anyone is going to do it, it must be Republicans. Which makes it very annoying when Republicans or conservatives suggest new entitlement-type programs. If we can’t ever shrink govt, can’t we at least have Repubs hold steady, instead of also trying to grow govt? What we have here is an advanced case of what I call “alcoholics anonymous syndrome”. I would like it if somebody would keep me away from the social security trough, but when it comes time for me to receive my benefits I will line up at that trough (and Medicare too, probably) just like everybody else. Problem is that the system is broke already, so there seems to be no way to back people out into privately funded programs. And when we pass the age of entitlement, you can bet that- having paid into it our entire lives- we will want to receive our promised benefits. SO, the only way to resolve this is to put a plan in motion that cuts things off in the future. And we all know how well future lawmakers will respect plans we put in place today. Why are we so weak?